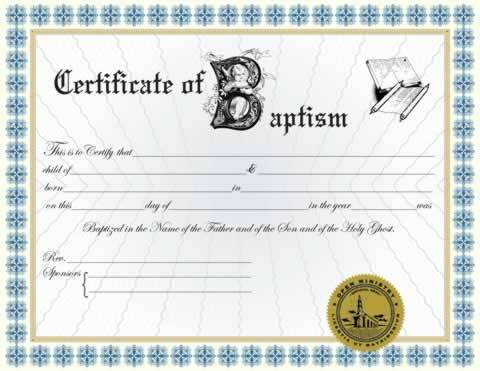 This personalized Baptism Certificate I can be pre-printed with name of the child, name of parent/guardian(s), date & place of child's birth, date of baptism, and signatures (minister, sponsors). Decorated with our gold embossed ministry seal. "Baptized in the name of the Father and of the Son and of the Holy Ghost." NOTE: Most fields are optional. Information not filled in will remain blank on certificate to be completed by the guardian, minister and/or witnesses. Certificate will be imprinted with the information exactly as entered. Please double check the spelling and capitalization. This Baptism Certificate is beautiful and can be individualized and showcased for the individual. All products are high quality and communicate to the receiver the value placed on the ceremony. Also very affordable. The custom Baptismal Certificate was beautiful. Very professional and I would recommend anyone who does a Baptism to purchase this one. The parents were so thrilled and impressed with the certificate, they stated that they didn't even think they would receive a certificate let alone one as nice as this. Thank you Open Ministry!! Beautiful certificate, better that others that I've seen.